The gift of the third eye is the gift to use your clairvoyance. Most people see what they want to see, versus, seeing things as they actually are. This is a problem in opening your Third Eye. You don’t want to spin, or even allow a perspective, other than the truth, the real truth, of what you’re seeing. Today, more than ever there is this dependency on using other people to see for us. In opening your Third Eye to your clairvoyance, you don’t want to rely on an intermediary. You have the ability to connect directly. Most specifically, to see clearly for yourself. It’s much different than seeing with your physical eyes. Opening your Third Eye is like opening a portal. 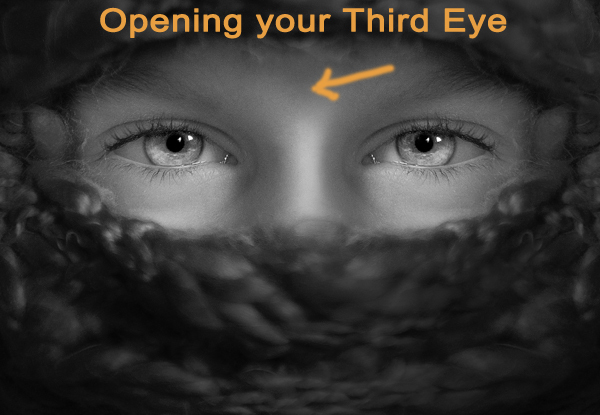 I will share with you several clear and powerful points to opening up your Third Eye. If you want, while listening to the podcast, see what you can see. Let it come to you. Don’t force it. And write your observations in the comments section below. Welcome to opening your Third Eye! Nothing has created more confusion than the enlightenment of the third eye. When it’s active it sees beyond the Earthly realm and across spaces that are unimaginable. There it is, that word that trips almost everybody up when the third eye is activated. Am I truly seeing or am I imagining things? Certainly we’ll get into that in a minute. The gift of the third eye, like all spiritual gifts I suppose, provides for true insight or it is considered a curse? Like all aspects of the humanity these two conditions do exist and they will continue. Your choice to spiritually see versus an insight you shouldn’t have is a dilemma. And we should address this first before even beginning into our topic. For if you believe that you shouldn’t see why continue? If you do want to see, why limit it? These two questions are stumbling blocks for most in their true desire to see. It’s been my experience that people want to see what they want to see. Certainly this is true in using physical eyes to see and it is also a pattern often observed in seeing with your third eye. While seeing what you want to see is enormously common, it is the exact opposite of what I wish to present. My thoughts are if you want to use your physical eyes to see why spin it? Today there has never been more spin, or challenge to your perspective – and ultimately it’s a good thing. For example, the world has accepted the idea that we need to have someone else listening or seeing for us. Perhaps this started when Mosses supposedly talked to God because the people were too afraid to talk to him directly. Fast forward to today, while we have the ability to watch, listen or read the full account of what any one says, we find people in the middle telling us what was just said. For example, If a President of the U.S. offers a State of the Union speech there are all kinds of people who act as intermediaries to tell you what you just heard. If you missed the event, in today’s world, with the smallest of effort, you can watch it again any time you wish. This is true for politics as it is for any other presentation. I guess the concept of someone relaying what they saw and heard is valid IF in fact you actually couldn’t be there to see the person or hear the person for yourself. But like the Hebrews at the base of Mount Sinai, if they wanted to see and hear the message directly from above they could have. If you think that is impossible, consider how easy it would be for God to speak from a burning bush from the top of canyon so that everyone below could hear. Seeing with your third eye is like this. You either are going to see what you want to see, by making things up, or worse you’re going to listen and repeat what other people supposedly have seen using their third eye and regurgitate what they’ve seen. This isn’t using your third eye to see. I need to be very direct about this. If you want to see directly then you’re in the right place. My purpose in presenting this podcast is to induct a few fundamental concepts in opening your third eye to the truth. And when I reference the word truth, I absolutely do not mean a perspective. Truth, for our purposes of definition, is Eternal. And if that word resonates at all it’s only because it’s a commonly used term used for God or Source. If you want to see, as in you really want to see using your third eye, why color it? So, I’m going to offer you some simple but strong little hints in opening your third eye. But before I do, I want to quickly address some challenges in opening your third eye. The third eye is like opening up a portal. Normally, you have a inkling of what your about to see before you actually see it using your physical eyes. This works because one scene blends into another. When driving along the coast for example the sights are smooth and continuous. Seeing with your third eye can be like this but lots of times it isn’t. This is jarring. Because you’re mind doesn’t know what do with scenes that aren’t smoothly connected. Therefore, be warned that seeing with your third eye may or may not, initially, and I repeat that word, initially, make sense. If you stay open it will. If you really want to open the portal of your third eye, you don’t want to control what you see. Just let yourself see. This sounds easy, and of coarse it is, but it also may take a little practice. The mind is designed to create physical association to what you’re seeing to assist the brain in processing the information. In opening up your Third Eye we’re going to allow the brain to be present but I’m going to encourage you NOT to use it. This is by far the hardest part. “How do you NOT use your brain in seeing with your Third Eye?” And it’s really a good question. So let’s really jump into it. The information your accessing goes beyond your brain. Accept that statement and come forward. Your first step to seeing with your Third Eye, is to soften your eyes. What this means is that you don’t want to use your physical eyes. Some people might instruct you to close your physical eyes but I won’t. This is what I mean by softening. As a quick example, I was once enduring a long conference call for business and I was playing with the curly pig-tailed telephone cord. I was extremely bored and I was twirling the cord from the base of my telephone handset to the base of the phone when I kind of self hypnotized myself. Believe me I wasn’t trying I was just bored. But in that moment, I kind of slipped through a portal. I was looking at the pigtail cord when my eyes softened and the reality of what was before me blurred and I could see beyond my physical eyes. This scared me and I quickly reacted and I immediately pulled back. Yet, I had discovered something. So, my first point in opening your Third Eye is to blur your eyes. And to ensure we’re on the same page I am not talking about putting sun tan lotion into your eyes to make them blurry. Just soften your eyes so that you’re really not using your eyes at all. The Third Eye is quite unlike your physical eyes. If blurring your eyes as a concept doesn’t make sense let me offer you another approach. If you were to lie on your back in bed and hold your eyes open with fixed concentration looking at some detail on the ceiling you’ll find at one point they’ll soften. Your eye muscles will tire and you may blink and while you can shut your eyes, I’d still prefer that you hold them open and look beyond the spot in the ceiling that now has become so totally boring to your mind. As this portal opens you will see. If I close my eyes during this time, I can actually see an eye. Exactly like an artist would see a close up of a physical eye. You can see every detail. I can now see it too, even with my eyes open and active, but this took some practice. Our next point, is let yourself see the truth. We’ve already briefly talked about this but for whatever reason, and especially with clairvoyance, there’s a desire to revert back to seeing as you would physically see with your eyes. I need to detail this a little bit more so you can have a greater understanding of what I’m sharing. In opening to clairvoyance allow the visual representations to come forth just as they are. It may feel a little different in not having reference points to things you’re seeing. It’s not really that weird because every night when you dream you process just like this. So, me asking you NOT to use your mind to interpret what you’re seeing is as natural as dreaming. If you think of it this way, you’ll have less resistance and that’s clearly intended! Let me offer you an example, when I start my Automatic Handwriting I can’t help but see. I’m not trying to see, it just happens. When you read, you can’t help but see the images too, but that’s a different path because you’re using you mind to create the images. Using your third eye to see and allowing the Universe to be the reference point for all interpretation is the essential. Let me expand seeing with your third eye. When you open your third eye and see you’ll want to allow Source to be the means by which everything is processed. This can feel a little awkward I guess in the same way you might interpret being put on a breathing machine. Normally, you’re accustomed to breathing on your own, and using this example, there is another Source – the machine – that does the breathing for you. You’re accustomed to using your body and well as your mind to process. Using your Third Eye you DO NOT want to do this. I’m asking that you let go of these physical components and let all images of your third eye be processed by Source. I’m making a distinction of outside of your body, however, I’m not suggesting that Source is outside of you. Source within you isn’t limited to your body … at all. Source within you, recognizes your body and if there is ever a confrontation or competition put forth by your mind/body the Source within you will politely step back. Not away, Source just allows you to create the separation, a little or a lot, as you choose. In seeing with your third eye you want to whole heartedly invite Source to do all the leading. When you get used to it, it won’t feel at all awkward. In fact, it will be preferred because you can actually see things as they are. This will automatically start happening if you’re using Source to process what you’re seeing. What do you see now? Do you want to share it? Drop a comment of what things you might be experiencing at the bottom of this post. Don’t be afraid because, after all, this is your whole purpose in opening up your third eye. Now, for the third point. You should expect to relearn how to see. Learning to see with your Third Eye is a lot like learning a new language. There are many similarities in learning a language but there is only one in using the Third Eye. And that is the images themselves. By the way, I should talk about this… Seeing clairvoyantly can be like flipping through an old school photo album. Each image is separate, and referencing our newer digital world, each image is it’s own file. There’s also the ability to see film. This can look like a movie trailer. It can also look like a short film. And then there is seeing with your third eye that feels like you’re into a 3 plus hour movie. Principally, all of it’s the same. If you go to compare notes with someone else they may have a preference in seeing stand-alone images. If you see film, and a friend of yours who’s practicing using their third eye is different – appreciate it. Don’t think that you’re doing it wrong. There is no such thing. Just keep practicing. Before we go on further let me share that all images are the same. Every film that you see is a still set of images that have been strung together. To be perfectly honest, these images are generally shot and projected at 24 frames per second. Again, this allows your mind to create or process the illusion. I share this so you can understand how your brain processes a stream of images what I am really interested in teaching is how you can access Source to process these images without using your mind/body. Don’t worry, you’ll get used to it. The fourth point is not worrying about the thought, that you’ll have at one time or another, which is, are you’re imagining things? It’s after you’ve opened up the portal to seeing that the mind will kick in an insert; fear, doubt, uncertainty on every level. This is to be expected but don’t pay any attention to it. I do want to offer some further clarity on the question, “Am I imagining this?” Versus, “Am I actually seeing with my third eye?” Imagination is when you project something into your mind to see something that you’re looking to create. For example, if I ask you to imagine having a purple car you probably can do it. The difference in seeing with your Third Eye is that there is no imagination, or projecting. The images come to you. I will admit this definition gets a little confusing the more you come down the road in seeing with your Third Eye. But in the beginning of your opening yourself to see clairvoyantly allow this definition to stand. As you progress, I’ll offer you some expanded direction concerning these details. Soften your eyes. Loosen up your physical senses so you can go beyond your eyes. Let yourself see the Truth. This means that you use Source, not your brain to process what you’re seeing. Expect to relearn how you see. Clairvoyance is a language that will take time for you to reacquaint yourself with. Don’t worry about the thought, “Am I imagining things?” Let the clairvoyant images, either in still pictures, or moving pictures come to you. As I love to encourage you to play spiritually, has there been anything that you’ve been seeing, with your third eye, while listening to this podcast? Let me know by making a comment in the comment section of this podcast post. It’s fun to share and mostly it gets you out of the closet and committed in seeing with your Third Eye. Using your third eye is much more real than what you’ve been seeing…. More on that later! Thanks for listening and I’ll hope to have you back for my next podcast!